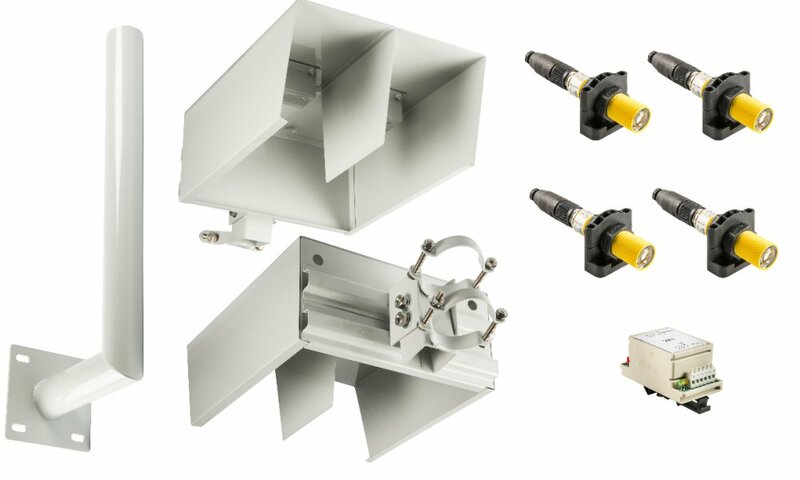 LVK 01 detects overheight vehicles with both high reliability and high sensitivity. IR beam technology with ultra-fast response allows for detection of objects as small as 4 cm at the speed of 100 km/h (common speed limit for heavy vehicles). Available also mode with lower sensibility, to grant optimum operation in bad weather conditions. Special beam encoding is used to prevent false detection even with direct sunlight, rain or snow. Dual beam system in combination with loop detectors (optional) is used for 100% accurate detection and removal of false positives. Height control is one of the key safety systems on roads. Overheight vehicles pose a great danger for themselves as well as for other participants in traffic due to possibility of collision with structures, elements or devices installed above the maximum allowed vehicle height (portals on open road, variable message signs, tunnel jet fans, cameras and detectors, etc.). Collision of the overheight vehicle with such structures can lead to great material loss, closed lanes with congestion and delays, and even human casualities. With early overheigh vehicle detection such scenario may turn completely different. LVK 01 detects overheight vehicles with both high reability and high sensitivity. IR beam technology with ultra-fast response allows for detection of objects as small as 4 cm at the speed of 100 km/h (common speed limit for heavy vehicles). Special beam encoding is used to prevent false detection even with direct sunlight, rain or snow. Dual beam system in combination with loop detectors (optional) is used for 100% accurate detection and removal of false positives. In conditions of heavy snow, LVK 01 can operate in mode of reduced sensitivity (50 cm at 100 km/h). This prevents false positives and leaves the height control system in normal operation. LVK 01 carries out continuous self-check operation. If one of the beams becomes misaligned or the sensor is broken or dirty, system reports error. Optionally, integrator may choose to include ILS 4 loop detector module for even higher reliability and removal of false positives. Integrator may also choose to include digital camera which takes a clear evidence of overheight vehicle and helps law enforcement or highway operator personnel. Also, RSO 4 (4 channel traffic light output unit) may be ordered to control traffic lights for height control system.